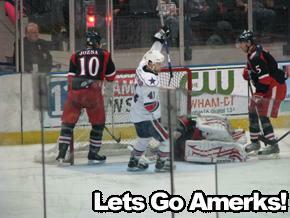 Another Late Penalty Costs Amerks · Let's Go Amerks! The Rochester Americans couldn’t hold the Grand Rapids Griffins when a late penalty by Adam Dennis gave the Griffins a power play opportunity that they capitalized on, allowingÂ the go ahead goal to take the lead 3-2 in the game with less than five minutes left. Two games in two nights the Amerks have taken undisciplined penalties with the score tied late in the third period which has led to losses.Â Many things have gone wrong this season, that being one of the many. Marek Zagrapan scored the Amerks first goal of the game on the power play, his 17th of the season.Â Franklin MacDonald had taken a hard shot from the blueline, Zagrapan picked up the rebound and easily put it in the net. The Griffins second goal of the game wasÂ scored by Tyler Redenbach who poked it into the net as Adam Dennis was trying to cover up the rebound.Â It didn’t help that Franklin MacDonald and Derek Whitmore were just standing there when it appeared as if they could have easily assisted in trying to knock the rebound away from the net. Mark Mancari scored his 19th goal of the season to tie the game 2-2 at 7:21 of the third period.Â Mancari skated down the center of the ice as Clarke MacArthur brought the puck in on the left hand side, he slid a great pass over to Mancari who burried the puck in the net. The Griffins were given a power play opportunity with four minutes left in the third period when Adam Dennis took a stupid penalty as he tripped Francis Lemieux as he skated past the net.Â A measly 22 seconds into the power play the Griffins scored the go ahead goal by Carl Corazzini. The Amerks were given a power play opportunity with 56 seconds left in the game but were not able to score. Tyler Plante was recalled to be the backup goalie in the Florida Panthers last game of the season.Â Bob Janosz, the Amerks goalie coach, was signed to a PTO to be the backup. After two periods the Amerks were outshot 31-13, it’s suprising the Amerks held on as long as they did. Kudos to Clarke MacArthur for putting in a solid effort on Saturday night, something we don’t get to see every night! With the season being over for the Buffalo Sabres and Florida Panthers we can expect to get some players back.Â Patrick Kaleta, Mike Weber, Andrej Sekera back from the Sabres.Â Tyler Plante should be back on Sunday from the Panthers, and Kamil Kreps was also on the clear day roster and may come back to finish the season. Luke Beaverson was seen leaving the arena with all of his equipment and sticks, my guess would be he’s going back to finish his senior year of college. The Lowell Devils and Amerks each have five games left, the Devils have 60 points and the Amerks are stuck at 56, if they want to not finish in last place we need to get on another unlikely hot streak. The Amerks are back at home on Sunday night to play the Syracuse Crunch, game time is 6:05pm.